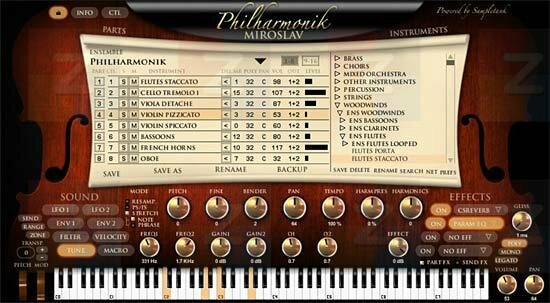 IK Multimedia's MiroSlav Philharmonic is a 16 track soft synthesizer that can be integrated and automated into any DAW. It's sample library and dynamic articulation are impressive. Euphonic Studio is happy to release our recording of Aaron Copeland’s Fanfare for the Common Man, composed in 1942 for the Cincinnati Symphony. IK Multimedia’s MiroSlav Philharmonic is a 16 track soft synthesizer that can be integrated and automated into any DAW. It’s sample library and dynamic articulation are impressive. I realized the score by playing each part into Sonar Platinum and then using the MIDI tracks to play a VST called Miroslav Philharmonic by IK Multimedia. I have been using IK Multimedia products in the studio and they offer a fine range of virtual instruments and plugins. I have always loved this piece, and I hope you do, too.